Last weekend I went with my Husband and a few ladies from my Sunday knitting group to the annual New Hampshire Sheep and Wool Festival - and wow did I learn a lot! 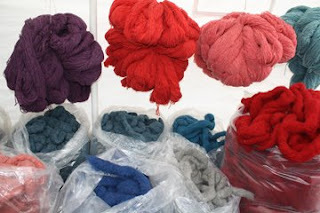 The photo above shows giant bushels of yarn above enormous bags of roving which is one stage of wool between the sheep and the knitting needles. Roving looks and feels kind of like thick cotton candy and people use it to spin their own yarn, which I saw a lot of at this sprawling festival. The festival had a variety of displays and vendors that celebrated the sheep and wool industry such as live animals that were for show or for purchase, and wool at its many stages. We saw a sheep being sheered, a lama limbo contest, silk worms, angora rabbits, the displays were endless! 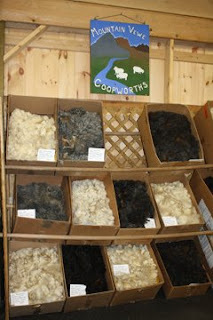 This second photo shows another way that wool was being sold at the festival, in it's raw form. People who purchase this wool need to card it to prepare the fiber for spinning, it's the stage before roving. 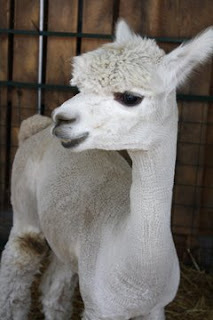 We also got to meet some live alpacas which was very exciting since I've never seen one in person. They were so soft, and friendly, and their giant eyes were mesmerizing. 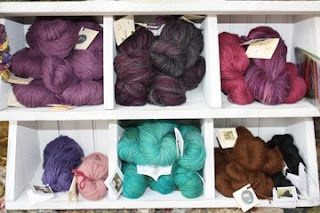 I purchased some alpaca yarn like in the photo below and have already made a little hat with it. If you've never been to a sheep and wool festival I highly recommend checking one out. They happen all over the country and at different times during the year. It's fun for everyone!